On a wild night a young book-dealer, David Filde, is at work in the dark library of an ancient, crumbling mansion, while outside the wind howls across the desolate moorland. But as he tries to catalogue the estate’s collection of rare and antiquated books a series of strange, unexplained events and apparitions threatens to unnerve him. David’s employer, the forbidding owner of the mansion, denies that anything is amiss. As he strives to convince Lord Gray that the mysterious phenomena and ghostly visitations are real David finds they must face together the source of the manifestations, the awful secrets that lie behind them and David’s own link to the terrors that haunt the house. 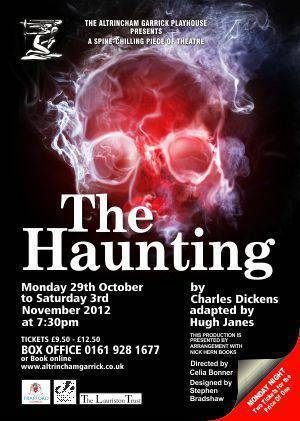 Adapted from Charles Dickens’ gripping ghost stories, this spine-chilling new play will have you on the edge of your seat. Dare you watch it alone? "Ghoulish and Spooky at Hallowe'en"
It's ghoulish; it's spooky and it's Hallowe'en. 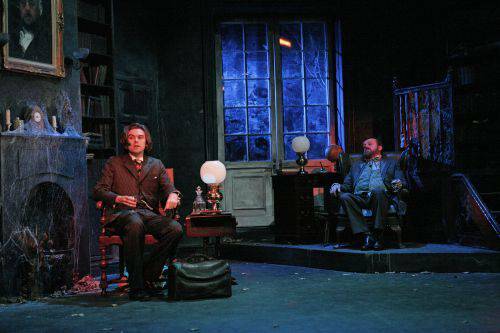 If The Haunting, a mainly two hander by Hugh Janes based on Charles Dickens' ghost stories doesn't send chills down your spine, I'll be spooked. 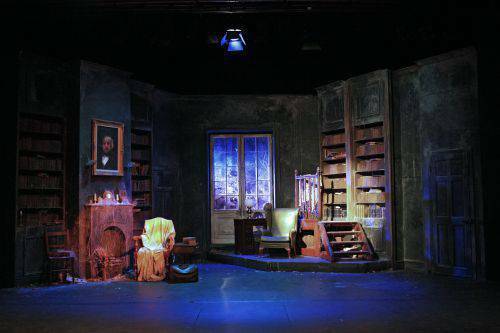 You feel trepidation just by seeing Stephen Bradshaw's darkened, cobwebbed set, never mind the unexplained screams and thunder created by Christine Mills and David Williams. Then there is the phenomena of books inexplicably flying off shelves, and doors apparently locking themselves not to mention Geoff Scullard's lighting effects put to good use as lightening or creating the atmosphere for the actual appearance of the ghost dressed in tattered bridal apparel (Grace Garside). The person who finds himself ensconced in the library of an English country house is young book dealer, David Filde (Sean Gonet) who innocently turns up to catalogue and value some antique books which once belonged to his uncle's colleague, the recently deceased Lord Gray. His co-actor, Mark Edgar, plays his successor, the new Lord Gray. He's a sceptic of all things spectral until David gradually convinces him of the macabre goings on in the house. 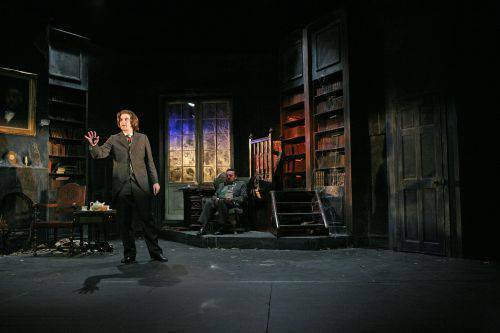 The special effects are spectacular but the play would get nowhere without the interaction between David Filde and Lord Gray. Both actors speak with expression or simply use a well-timed pause to make you hold your breath. It turns out that the pair have more in common than at first thought and there is a thought-provoking twist in the tale. My reservation is that Janes' script is a little too wordy although both actors cope well. The backstage staff ensure that you'll journey to the edge of terror in this play so well directed by Celia Bonner. 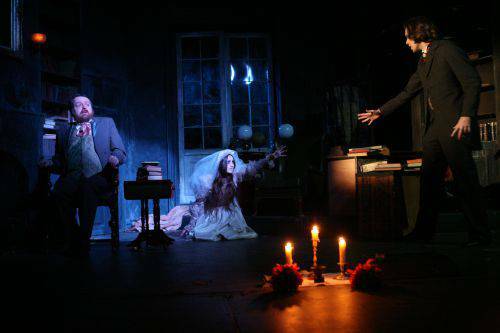 Adapted by Hugh Janes from various short stories and ideas from Charles Dickens novels, the tale of ghostly goings-on at a secluded manor house on the edge of a foggy moor has echoes of Susan Hills ?The Woman in Black? 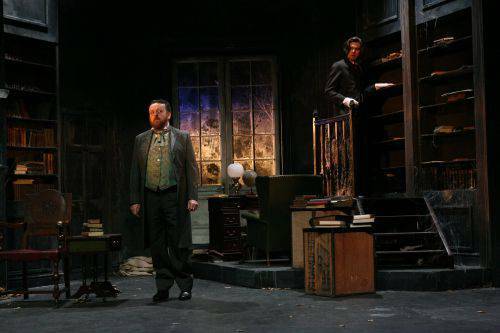 (21 years in the West End and counting) with its similar central character in David Filde - played by Sean Gonet - who arrives to sort out its owner?s affairs, in this case a book collection belonging to Lord Gray - played by Mark Edgar. As the book dealer ? and we ? soon discover, the house is haunted by the ghost of a young woman. This script is no walk in the park for the technical crew; Director Celia Bonner and her team deliver technical genius with military precision as we have shocks and sudden noises, swirling mists, sombre lighting effects, a spinning chair, doors opening and slamming shut by themselves, false walls, flying books, almost a constant wild track of howling and breezes, Music, 30 + sound effects ?and all that is just in the first 20 minutes! 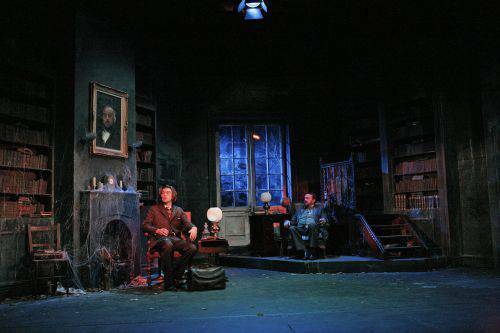 Celia and her dream team created an air of melancholy and one of the biggest statements of them all was the ingenious, creepy old library set. Both Mark & Sean - who were aptly cast ? gave strong performances indeed. The role of the refined and diffident aristocratic Lord Gray sits very convincingly on Marks shoulders, complete with some nice dry humour on occasion. Sean is very convincing as the enthusiastic bookworm and gave us a very mature and accomplished performance, a great duo who evidently work well together. There is an undertone throughout the play ? a ghostly hum, as of wind, which may be forgotten by the audience occasionally, but which gives even the moments of silence an eerie sense of supernatural. This is the second 3-hander this season presented by the Garrick which is refreshing and unusual but obviously works and manages to sell enough tickets.? Bravo to the team at Altrincham Garrick who succeed to run such an inspirational company. Yet again, I say congratulations on another triumph!